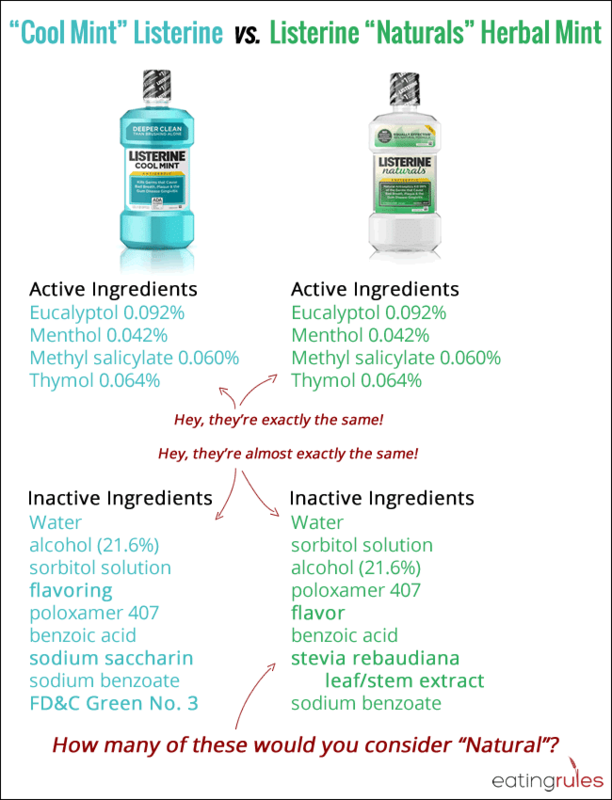 Listerine "Naturals" are not natural! I’ve been suffering from a lingering sore throat for the past few weeks, and I finally went to my doctor a couple of days ago. One of the things he recommended was to gargle with Listerine Antiseptic mouthwash. So this afternoon I went to our neighborhood pharmacy to pick some up. I was excited to find the bottle of “Listerine Naturals” mouthwash. Inside the bottle was a clear liquid, a noticeable contrast to the impossibly blue “Cool Mint” version sitting on the shelf next to it. Eager to figure out the difference between the regular stuff and the “natural” version — especially since I’m always skeptical of “natural” claims — I started comparing the labels. The bottle of “Naturals” proudly boasts that it’s “Equally Effective” as the regular stuff, and it is a “99% Natural Formula.” Upon closer inspection, it’s easy to see how they make the effectiveness claim — the active ingredients are exactly the same. But if you check out the inactive ingredients, it’s a surprisingly similar list. In fact, only three ingredients are different! The first difference is “flavoring” vs. “flavor” — so that could be anything, natural or otherwise (and they’re most likely otherwise). Then they’ve replaced the sodium saccharin (an artificial sweetener) with stevia extract (which may or may not actually be natural, depending on how it’s been extracted and what else has been done to it). Finally, they’ve omitted the FD&C Green Dye (which also happens to be banned in Europe). That one, I’ll admit, is a significant improvement. As for the remaining ingredients in the “Naturals” version, I’d argue that the vast majority of them are not truly natural. Yes, they may exist “in nature” in some form, but most of these have been produced through industrial processes. Sorbitol, for example, is a sugar alcohol that is usually created for products by adding enzymes to corn syrup, most likely derived from genetically modified crops. And probably the least “natural” of the bunch? Poloxamer 407, which is “a triblock copolymer consisting of a central hydrophobic block of polypropylene glycol flanked by two hydrophilic blocks of polyethylene glycol,” according to Wikipedia. So let’s not be fooled. 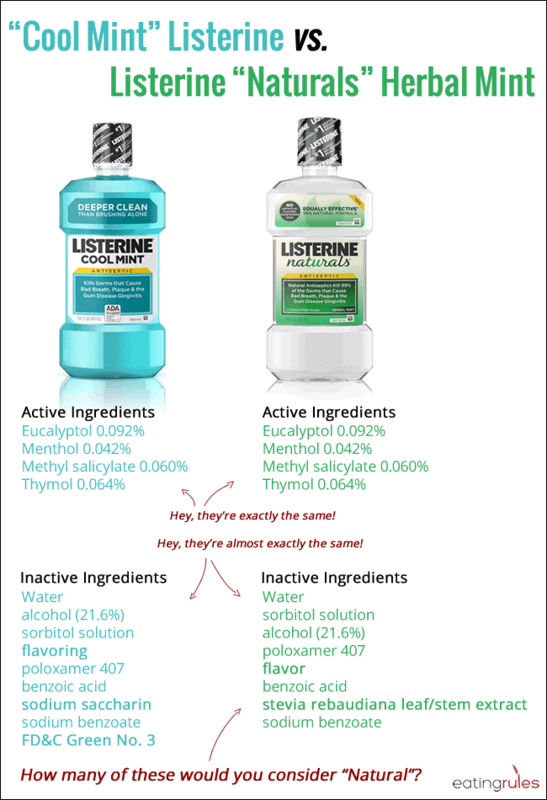 Listerine “Naturals” may be a slight improvement over the regular stuff, but it sure as heck isn’t actually natural. That’s good to know. Do you have any suggestions then for alternative mouth washes To use? I was so glad to read this. I spent quite a while in front of this aisle the other day searching for something with the lesser chemicals. The sodium saccharin was definitely out for me but it was not easy. I finally did decide to purchase this product because of the no artificial color but they don’t make this easy for you. Are there any on the market that are better that you know of? Thanks for you help. I am not 100% because I have never checked the ingredients (I don’t use mouthwash) but I know Tom’s of Maine makes a “natural” mouthwash. They sell it at my local CVS. 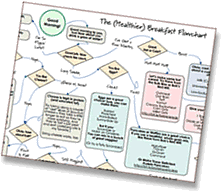 It might be worth checking out…. Yep, totally agreed Andrew. Whether mouthwash or food labels, natural means nothing. You have to read, read, read. For mouthwash, I’ve gone to using half hydrogen peroxide (its a brown square bottle at Target) and half water. The label says you can dilute it and use it that way, and my (wonderful) dentist say it is a fine solution , Really cheap too! You can check out hundreds of thousands of products at Skin Deep on the Environmental Working Group’s website. Skin Deep’s product ratings are based on the known hazards associated with ingredients listed on labels. These ratings represent EWG’s best effort to present solid information on cosmetic safety. So check out your favorite product to see if it’s fit for use. coconut oil makes a good mouth rinse and “toothpaste” – it’s naturally anti-bacterial. also baking soda, Bob’s Red Mill makes a baking soda, that I use for my teeth.